המדרגות שהן גבוהות עשרה טפחים נותן פאה מכל אחת ואחת ואם היו ראשי שורות מעורבין נותן פאה מאחת על הכל. Mishna Peah 3:1 mentions an argument between Bet Shammai and Bet Hillel about separate rows of produce that are planted in between trees, whether Peah is given from one such row for everything or separately in each row. However both of them agree that if the tops of rows are mixed up and are not evenly separated by trees then Peah is given from one row for everything. The Tosefta cites a similar case regarding separate rows of produce. 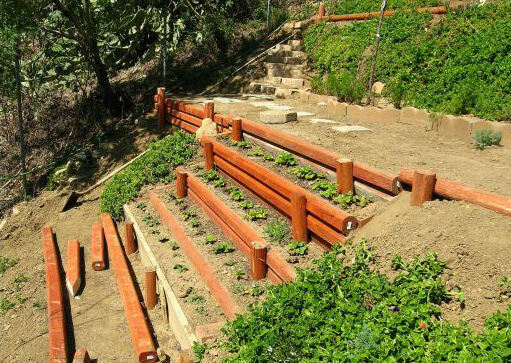 The Tosefta is talking about the same type of produce that is planted in a garden that is on a slope, so that each row of plants is growing one above the other, as shown on the picture below. Stepped garden with rows of grass growing one above the other. A Tefach (plural: Tefachim), known in English as a handbreadth, is a unit of measure used in Talmudic times, which is roughly the size of an adult fist. There are 6 Tefachim in one Amah. Since an Amah approximately equals to 1.5 – 2 feet (55 – 70 cm), one Tefach approximately equals to ¼ – ⅓ feet (9.1 – 11.6 cm). There is a principal that an area that is elevated by at least 10 Tefachim above ground level is considered to be a separate domain from the area on the ground level and can have different rules apply to it. We find this principal used in a variety of applications throughout the Jewish law. For examples see Tosefta Shabbat 1:1 and Tosefta Eruvin 2:3. Since each step is considered to be a separate domain it is like its own separate field and Peah must be left from each and every step. Obviously the minimum amount of Peah that needs to be left is 1/60th of the produce located on each step. From this Tosefta and from another Beraita quoted in Talmud Yerushalmi (Peah 2:2, Daf 12a) it is clear that if each step is lower than 10 Tefachim then the farmer should leave Peah on one of the steps for the whole field. The reason is obvious that since each step is not considered to be a separate domain, all of the steps together are like a single field from which Peah needs to be left only in one place. However the conclusion of the Sugya (discussion) in Talmud Yerushalmi (ibid.) is that it is not dependent on the height of the steps, but rather on whether the farmer needs to lift up his plough as he moves from one step to the next. So even if the steps are lower than 10 Tefachim if the farmer needs to pick up the plough in order to move it to the next step then Peah needs to be left separately on each step. It seems to me that the conclusion of the Yerushalmi was not the original intent of this Tosefta, but rather is a new conclusion based on the contradiction in various sources that the Yerushalmi quotes. It is not clear what the Tosefta means by having the tops of each step mixed up. Saul Lieberman in Tosefta Kepshuta proposes that it is referring to a garden in a shape of a spiral around a mountain where each step is not flat, but rather slanted, so the top of each step is roughly at the same level as the bottom of the next step. I would like to suggest that the Tosefta is probably referring to a farmer who planted produce on the slopes of rocky Judean Hills, such as shown on the picture below. Due to many rocks in the ground natural uneven steps are formed on the hill. A hill in Ramat Bet Shemesh, Israel. Notice the natural uneven steps that are formed on the side of the hill. Since there is no clear separation of domains between the different levels all of them together are considered to be a single field and therefore Peah needs to be left only on one of these steps that would cover the whole field. The amount of Peah left on that one step would be 1/60th of the whole field. קצר חציה ומכר את הקציר קצר חציה והקדיש את הקציר נותן פאה מן המשוייר על הכל. Mishna Peah 2:8 states that if a person harvested only half of his field and then sold the other half of his field then the buyer of the second half has to give Peah for the whole field including the first half that was harvested by the original owner. Also if a person harvested half of his field and then sanctified the second half of his field, meaning that he donated it to the Bet Hamikdash and then the treasurer of the Bet Hamikdash sold it off for money, then whoever bought it from the Temple treasury has to give Peah for the whole field, including the first half that was harvested by the original owner. The Tosefta cites a similar case to the case in the Mishna but with a difference that in the end half of the field remained not harvested and the first half that was harvested was either sold or sanctified by the owner, then the original owner of the field is responsible for giving Peah from the remaining half and not the buyer of the produce as is in the case of the Mishna. By Torah law a person can sanctify any object in his possession and that way donate it or its value to the Bet Hamikdash. This is specifically known as Hekdish (הקדש), meaning “consecrated”. Generally there were three types of donations to the Temple. A person could donate cash, an animal that was fitting for a sacrifice, or any other object, including property. Donations of cash were done for various reasons, such as Machatzit Hashekel (מחצית השקל), which was an annual donations of half a shekel to the Temple that had to be given by all male Jews (see Shemot 30:11-16), or a person could give his value, Erech (ערך), as specified in the Torah (see Vayikra 27:1-8), or a person could simply give a cash donation to the Temple for no specific reason. Donations of animals that were fit to be brought as sacrifices were known as Kadshei Mizbeach (קדשי מזבח), meaning “consecrated for the altar”. Donations of all other objects, including property, were known as Kadshei Bedek Habayit (קדשי בדק הבית), meaning “consecrated for repairs of the building.” The money that was donated in these different ways had to be tracked separately and was spent on different things in the Bet Hamikdash. Donated objects and property, Kadshei Bedek Habayit, were collected by the Temple treasury and then auctioned off for cash. The different ways that in which the Temple treasury used the money from various donations are discussed in various places in the Mishna, the Tosefta and the Talmud, most of them in tractates Shekalim, Arachin and Meilah. The farmer would have to give the minimum amount of Peah that is Rabbinically required, which is 1/60th of the total produce of the field, as was mentioned above in Tosefta 1:1, note 8. Since the best way to give Peah is considered to be at the end of the harvest, as was mentioned above in Tosefta 1:5, the farmer did not have to set it aside until he completely finished harvesting the whole field. Therefore even though he was planning to sell half of the produce of the field before he finished harvesting the rest of the field, he could leave Peah in the end of his harvest to cover the complete amount of crops, including what he sold earlier. I would like to point out that Pinchas Kehati in his commentary on Mishna Peah 2:8 (Pinchas Kehati, “Mishnayot Mevuarot”, Peah 2:8, Halokeach Noten Peah Lakol) seems to have made a mistake regarding the case mentioned in this Tosefta. He writes that it is obvious (from the Mishna) that if the farmer sold half of the produce and then harvested the second half of the produce for himself, then each owner would have to give Peah for his own produce, the farmer for his half and the buyer for his half. However from this Tosefta it is clear that the buyer of the first half does not have to give any Peah and the farmer has to leave enough Peah from the second half of the produce to cover the whole amount, including what was sold. It seems to me that the reason for this law is since the Mishna (Peah 2:7) states that the main Mitzvah (commandment) is to give Peah from the standing crop, even though the person can give, post factum (Bediavad), from harvested crops, as was mentioned earlier in Tosefta 1:6, the Rabbis required that the responsibility of giving Peah remains with the farmer since he is the one who has access to standing crops in the end of his harvest. Therefore the farmer was obligated to give Peah from the standing crops for the whole amount as opposed to the buyer giving Peah for his half and the farmer giving only for his half. אילו מפסיקין לפיאה: הנחל, והשלולית, דרך היחיד, ודרך הרבים, ושביל היחיד, ושביל הרבים הקבוע בימות החמה ובימות הגשמים, הבּוּר, והניר, וזרע אחר, וקוצר לשחת, ושלשה תלמים של פתיח, ואמת המים שאינה יכולה ליקצר כאחת. רבי יהודה אומר אם עומד באמצע וקוצר מכאן ומכאן מפסיק, ואם לאו אין מפסיק. אכלה חגב, אכלה גובאי, קירסמוה נמלים, שברתה הרוח או בהמה הכל מודים שאם חרש מפסיק ואם לאו אינו מפסיק. Mishnayot Peah 2:1 and 2:2 mention different landmarks that interrupt a field and obligate the owner to give Peah twice from both sections of the field, before and after the landmark. This Tosefta expands on that law. The Torah says regarding the Mitzvah (commandment) of Peah, “… you should not cut the corners of your field …” See Vayikra 19:9. Talmud Yerushalmi (Peah 2:1, Daf 10b) learns out from the fact that the verse says “your field” that Peah must be left separately for each particular field. Meaning that if a person has two fields he is not allowed not to leave any Peah in one field and then leave double the amount of Peah in the second field, but rather he must leave the proper amount of Peah in each field. The Tosefta lists a list of landmarks that cut a single field in half therefore comprising two separate fields as far as the Mitzvah of Peah is concerned. Hebrew word נחל (Nachal) means a stream that does not necessarily flow with water all year around, as opposed to a נהר (Nahar) – a river, which does flow constantly. In the land of Israel there are a lot of streams, known by their Arabic name – Wadi, that are dry most of the year, but fill up with water in the winter during the rainy season. There is only one real river (Nahar) in Israel and that is the Jordan (Nahar Hayarden). The Tosefta is referring to the Wadi type of a stream. Obviously if a river would cut a field in half it would constitute a divider with regard to Peah as well, but the Tosefta mentions the stream, because it is less obvious of the two. There is an argument in Talmud Bavli (Bava Kama 61a) about what type of water reservoir שלולית (Shlulit) is. The Babylonian opinion of Rav Yehudah in the name of Shmuel explains that it is a place where rain water collects. The Palestinian opinion of Rav Bibi in the name of Rav Yochanan is that it is the main reservoir with water that feeds water to other ditches in the field. The name Shlulit comes from the Hebrew word שלל (Shalal) which means “booty” or “something that is gathered” and therefore makes sense according to both opinions. According to Shmuel it refers to the collected rain water and according to Rav Yochanan it refers to the water that is collected by the pits from the reservoir. According to Rav Yochanan the reservoir could be full with water all year around due to some underground source and therefore permanent, whereas according to Shmuel the reservoir only gets filled up when it rains and is therefore temporary. Shmuel’s explanation makes more sense, because it is obvious that a permanent water reservoir would constitute a divider of the field. However if the reservoir is only temporary then it is similar to the Wadi stream listed before and needs to be listed in the Tosefta since we might think that it does not constitute a divider of the field since it is not there most of the year when it does not rain. The modern use of the word Shlulit in Hebrew follows Shmuel’s opinion that it is a temporary body of water created by rain regardless of its size, such as a small puddle or a large flooded area. A road, known in Latin as Via, is a way where people could pass with carriages and animals in both directions. By differentiating between private and public roads the Tosefta is referring to the width of the road and not necessarily to its ownership. The Mishna (Bava Batra 6:7) states that a private road is 4 Amot wide and a public road is 16 Amot wide. Amah (plural: Amot) is a unit of measurement, usually translated as a cubit, used in the Talmudic times which approximately equals to 1.5 – 2 feet (55 – 70 cm). The measurement of the private road given by the Mishna is referring to the Roman law, known as the Law of Twelve Tables (Lex Duodecim Tabularum or Duodecim Tabulae). According to the Law of Twelve Tables (Table VIII, Law VIII) if a property owner was to make a road (i.e. a private road – Viae Privatae in Latin), “where a road runs in a straight line, it shall be 8 feet, and where it curves, it shall be 16 feet in width.” The Roman foot was approximately equal to 0.975 English feet (29.7 cm) (See William Smith, A dictionary of Greek and Roman antiquities, 2nd edition, 1859, entry Mensura, p. 757). Therefore 1 Roman foot roughly equals to ½ Amah, and 8 Roman feet equals to 4 Amot. The width of a public road (Viae Publicae in Latin) was not clearly defined in Roman law, so various public roads varied in width, but average Roman roads were only 16 Roman feet in width, not 32 Roman feet as would be implied by the Mishna (16 Amot = 32 Roman feet). For a discussion of the correlations between Roman road standards and the measurements given in the Mishna see Daniel Sperber, “The City in Roman Palestine”, Oxford University Press, 1998, chapter 7. A private path, known in Latin as Iter, is an unpaved narrow road across private land where people had the right to pass on foot to get to their fields. Travel on a path was intended only in one direction at any given time which is why the Roman law did not prescribe a minimum width for it. People could not pass on a private path with a carriage. Since the Tosefta says in the next statement that a public path had to be permanent it implies that a private path could even be temporary, meaning that it was not passable all year around, but only in certain months. A public path, known in Latin as Actus, is an unpaved narrow road across public land where people had the right to pass with a carriage. The Tosefta specifically states that the public path had to be permanent, meaning that it was passable all year around. It should be noted that in many editions of the Mishna this statement is reversed and the Mishna says that it is the private path that had to be permanent, but not the public path, in order to constitute a divider with regard to Peah. According to either reading it is not clear why a temporary path would constitute a divider for Peah in one case, whether it was private or public, but not in the other, since the width of either path was roughly the same. Fallow land is land where nothing has been planted during a particular season. If a field is planted with crops every single year non-stop then the soil gets depleted of its nutrients and crops do not grow well. Therefore farmers would leave whole fields or sections of fields fallow for a season so that the soil could replenish its nutrients. Newly broken land is referring to fallow land that has been ploughed for the first time. Such land does not produce very good harvests in the first season or two. Therefore it constitutes a divider with regard to Peah since agriculturally it is significantly different from the rest of the field. For example, if in a wheat field there was a strip of land which was planted with cucumbers it would constitute a divider with regard to Peah. Early harvested produce was unfit for human consumption and was used as feed for animals. Usually there were separate crops planted for human and animal consumption. However, I suspect that if in a particular year crops that have been intended for animal feed have been damaged, a farmer may end up harvesting regular crops early before they fully mature in order to provide enough food for his animals. This was considered to be harvesting in a destructive manner since the produce was not allowed to be fully mature and fit for human consumption. It should be noted that the Mishna quotes this statement regarding harvesting in a destructive manner in the name of Rebbi Meir, and it quotes the Chachamim (Sages) who argue on Rebbi Meir and say that such a strip of land does constitute an interruption of the field. Since the Chachamim are the majority the Halacha (law) would follow their opinion. However the Tosefta states this law anonymously implying that it is the Halacha. A ridge is a small bump that goes in a line across the field. A furrow is a dip in the ground created by the plough. The ridges and furrows were created by the plough since the traditional ploughs turned the soil over in one direction only and therefore when the soil was pushed to the side it created a ridge. Depending how deep the plough was pushed into the ground the furrow and ridge could have been made bigger or smaller. I would assume that farmers made three ridges next to each other in order to create some kind of a visible marker in the field that would divide two different plots. Since this was a division marker it also divided the field with regard to Peah. This is probably referring to the ditches that were used to irrigate the field. Since they were not used as dividers, but rather is pipes as long as they were narrow enough that a farmer could stand on one side of the ditch and harvest the crops on the opposite side of the ditch it was considered to be a part of the field and not a divider. However if the ditch was wide enough that farmer could not harvest the opposite side of the ditch from his side it was considered to be a divider with regard to Peah despite the fact that it was not intended to be so. It is not clear how Rebbi Yehudah argues on the Tanna Kama since both of them seem to say that if the farmer can stand on one side of the ditch and harvest the opposite side then it does not constitute a divider, but if the farmer cannot reach the opposite side of the ditch and must step inside the ditch itself in order to reach the opposite side then it does constitute a divider with regard to Peah. Due to this problem the Vilna Gaon adds an extra word into Rebbi Yehudah’s statement so it reads as follows: “אם עומד באמצע ואינו קוצר מכאן ומכאן מפסיק …” – If [the farmer] is standing in the middle [of the ditch] and he cannot harvest on both sides [because he cannot reach either side from the center of the ditch, then] it interrupts [the field with regard to Peah …], but if he can reach each side from the center of the ditch, even though he cannot reach the opposite side of the ditch from the other side of the ditch then it does not interrupt the field. However the Tanna Kama is more stringent than Rebbi Yehudah and holds that even if he can reach each side of the ditch by standing in its center and yet he cannot reach the opposite side of the ditch while standing on one side then it does interrupt the field with regard to Peah. However this textual emendation was the Vilna Gaon’s invention and is not supported by any manuscripts. Saul Lieberman in Tosefta Kepshuta solves the problem of this argument differently without any textual emendations. He says that they do not argue about the width of the ditch, but rather whether the ditch contains water in it or not. According to his explanation Rebbi Yehudah is more stringent than the Tanna Kama and he holds that the ditch interrupts the field if the farmer cannot reach the opposite side even if the ditch does not contain any water. However the Tanna Kama holds that in interrupts the field only if it has water in it, however if it does not have any water in it then it does not interrupt even if the farmer cannot reach from one side of the ditch to the other. I have chosen to explain the Tosefta according to Lieberman’s explanation, because it does not require any textual emendation, even though I admit that it is somewhat forced into the text. Hebrew word חגב (Chagav) refers generally to all short-horned grasshoppers of the family Acrididae that are Kosher, as mentioned by the Torah. See Vayikra 11:22. Talmud Bavli (Chulin 65a) quotes a Beraita that says that a Chagav is a נדיין (Nadyan), per the correct reading in the Aruch (entry נדיין) and not גדיאן as in the printed editions of Talmud Bavli. Aruch Hashalem (entry נדיין) says that Nadyan comes from the Persian word Nida which means “to call” referring to the grasshoppers chirping and twittering ability which is their mating call. This of course does not provide a specific hint to the particular species of grasshoppers. Tosefta Chulin 3:9 lists four identification marks of a Chagav that makes it Kosher. There are a bunch of different grasshopper species that live in the Land of Israel or migrate from Egypt or the Arabian peninsula and fit this description so there is simply not enough information to identify the specific species. Most probably the word Chagav refers to all species of grasshoppers that fit this vague description and therefore I have simply translated it as grasshopper. Aramaic word גובאי (Govai) refers generally to locust. The same Beraita in Talmud Bavli (Chulin 65a) identifies Govai with the ארבה (Arbeh), as mentioned by the Torah, which means locust. See Vayikra 11:22. Locust is the swarming phase of short-horned grasshoppers of the family Acrididae. It is simply a behavior of the grasshoppers when they gather in large groups and start consuming crops in large quantities, even though normally grasshoppers are solitary insects. As was mentioned in the previous note the word Govai does not refer to a particular species of locust, because the signs that define it are very vague. The Tosefta is most probably referring to the most common genus of ants found in Israel – Messor, known in Hebrew asנמלת הקציר – Harvester ant. These ants live in fields and collect seeds for their nests. 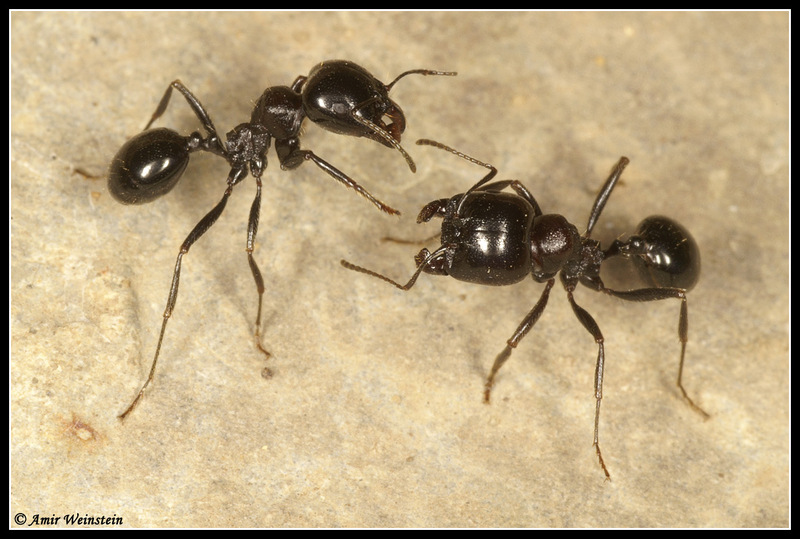 There are a few species of the Messor genus of ants that live in Israel, such as Messor Semirufus, Messor Ebeninus, Messor Arenarius Ratus, Messor Aegyptiacus and Messor Arenarius, all of which exhibit similar behavior. They can cut down significant amounts of crops that contain seeds like wheat and barley. Black Harvester ants from Israel. נמלת קציר שחורה – Messor Ebeninus. Photo: Amir Weinstein. Since the Tosefta mentioned an argument between Rebbi Yehudah and the Tanna Kama it now clarifies that everyone agrees regarding this next statement. Talmud Yerushalmi (Peah 2:1, Daf 11b) explains that the reason that he is only obligated in Peah if he ploughed the land afterwards is because in order to become obligated in Peah the farmer has to do an act of harvesting, as was explained earlier in Tosefta Peah 1:1, note 9. Since in this case the crops were not harvested by the farmer, but rather were damaged by some outside force they never became obligated in Peah and crops that themselves are not obligated in Peah cannot interrupt the field with regard to Peah. However a ploughed section of land does interrupt the field with regard to Peah was stated earlier in the Tosefta and therefore in order for this section of crops to interrupt the field it has to be ploughed over. Obviously the Tosefta is talking about that the damaged crops were the same kind of crops as the rest of the field, since a different kind of crops interrupts by itself was stated above. ר’ יוסי בי רבי יהודה אומר רוטבות תמרה פטורות מן הפיאה שאין ראשון ממתין לאחרון. רבי אלעזר ברבי צדוק אומר השיזפין חייבין בפיאה. אחרים אומרים אף בנות שוח וחלחלחין. Mishna Peah 1:5 states that dates among other fruit are obligated in Peah. This Tosefta quotes a dissenting opinion regarding dates as well as mentions other fruit that are obligated in Peah that the Mishna does not mention. Hababauk is the term used for the female flower and the period just after pollination when the young fruit is still creamy white before gradually turning green at the utab stage. At the utab stage there is a rapid increase in size, weight, and reducing sugars; it is the period of highest acid activity and moisture content (up to 85%). All factors level off at the end of this stage when the fruit starts to turn yellow (or red according to variety). At this point the date seed could already germinate and the fruit is botanically mature. At the khalaal stage weight gain is slow but sucrose content increases, moisture content goes down, and tannins will start to precipitate and lose their astringency. In some varieties this latter process evolves rapidly, which makes them already palatable at the khalaal stage, and one could speak of commercial maturity for this type of fruit at this stage. With (normally) the tips of the fruit starting to turn brown, the utab stage sets in which is characterized by a decrease in weight due to moisture loss, a partial (the degree depending on the variety) inversion of sucrose into invert sugar and a browning of the skin and softening of the tissues. The moisture content goes down to about 35% and the dates at this stage are sold as fresh fruit. Only when the dates are left to ripen further on the palm will they turn into tamr, climatic conditions permitting, characterized by a moisture content at which the date is self-preserving. The upper limit for the date to be self-preserving lies at around 24-25%. Dates distinguish themselves therefore from most other fruit in that they have a botanical maturity and at least 3 distinct commercial maturation levels, the sweet khalaal, the utab, and the tamr stage. The Hebrew word Rotev is the same as the Arabic word Rutab, both of which mean “wet” or “moist”. The Tosefta is referring to regular dates in the Rutab stage and not to some special species of dates. Generally, dates in a cluster and all clusters on a palm do not ripen at the same time. A number of pickings may have to be made over a period of several weeks. See Julia F. Morton, “Fruits of Warm Climates”, Florida Flair Books, 1987, entry Date, p. 5-11. However it is not clear why Rebbi Yossi Ben Rebbi Yehudah would single out dates in the Rutab stage as opposed to just saying dates in general, since this phenomenon of non-even ripening occurs with dates of all stages. It is possible that the specific cultivar of dates that he was referring to was specifically harvested in the Rutab stage, as opposed to other stages. The stage at which the dates are picked for consumption is highly dependent on the specific cultivar and climate where they are grown. It should be noted that the cultivar of the Date Palm (Phoenix Dactylifera) that grew in the Land of Israel during the time of the Mishna was the Judean Date Palm which has been extinct for over 1500 years, and only recently (2005) has been grown again from seeds found in Herod’s palace in Masada, so no information exists about the behavior of this specific cultivar of the date palm. See “Germination, Genetics, and Growth of an Ancient Date Seed”, Sarah Sallon, Elaine Solowey, Yuval Cohen, Raia Korchinsky, Markus Egli, Ivan Woodhatch, Orit Simchoni, and Mordechai Kislev, Science Magazine, 13 June 2008, Vol. 320. No. 5882, p. 1464. It is possible that in this specific cultivar some of the dates transformed from the Rutab to the Tamr stage earlier than others and had to be picked separately thus prompting Rebbi Yossi Ben Rebbi Yehudah to exempt them from Peah. Formation and Ripening of the Dates. Used with permission from FAO. Talmud Yerushalmi (Peah 1:4, Daf 8b) points out that the Mishna (Peah 1:5) argues on Rebbi Yossi Ben Rebbi Yehudah, since it plainly says that dates are obligated in Peah, implying that all dates are obligated in Peah regardless of their stage. Yerushalmi points out that since all ripe dates swell at the same time it is considered to be that they all are ready for harvesting simultaneously. 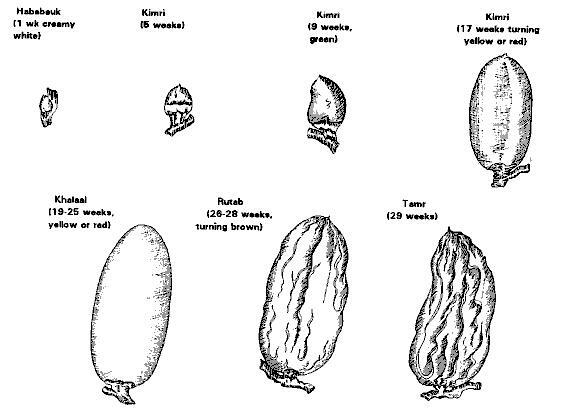 The Yerushalmi is probably referring to the initial swelling of the date when it reaches the Khalal stage and becomes eatable and suitable for harvesting. The fact that people prefer to wait for the dates to be picked at different stages is not considered to be significant enough for it to qualify for an exemption from Peah due to different times of picking. It seems to me that the Mishna requires completely different harvest seasons for fruit in order for them to be exempt from Peah as I already explained in the previous Tosefta, note 5, as is the case with the common figs. 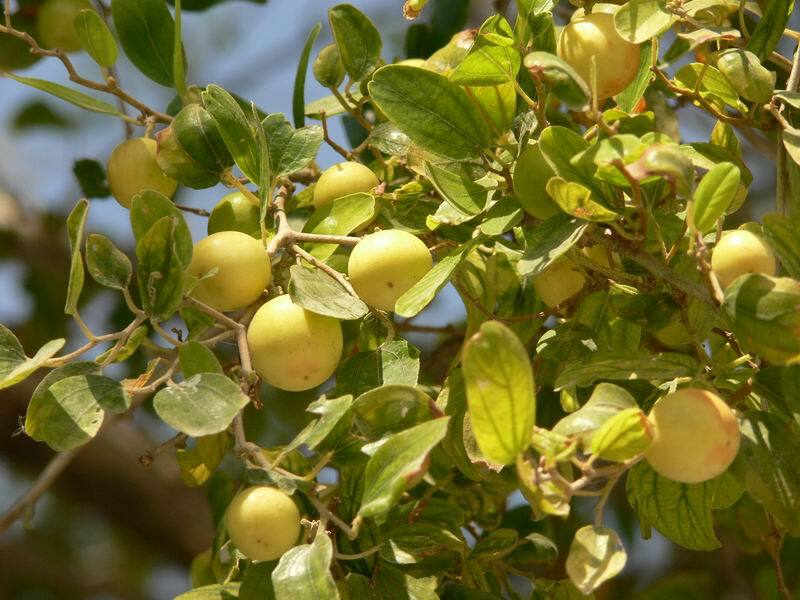 Jujube (Ziziphus species) is a fruit of a thorn tree that tastes similar to an apple. The Hebrew name Shizfin comes from its Greek name ζίζυφον (Zizyfon) which in turn comes from the Arabic word Zizouf, which is the Arabic name for the Lotus Jujube tree (Ziziphus Lotus), a tree considered to be holy by the Muslims. Most probably the Tosefta is referring specifically to the Ziziphus Spina-Christi, commonly known as Christ’s Thorn Jujube, which is the most common type of jujubes that grows in the Land of Israel. It is also possible that it is referring to Ziziphus Vulgaris which is a cultivated species of jujubes, which is native to Syria was possibly imported into Israel by the Romans. 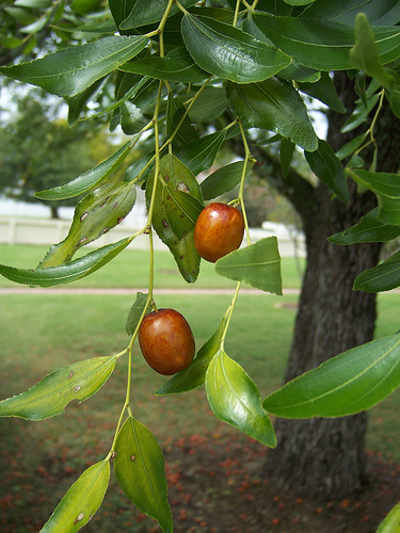 Zizphus Vulgaris produces larger and tastier fruit than Christ’s Thorn Jujube. Jujubes produce fruit many months out of the year, but have a single long harvesting season, which would make them obligated in Peah according to the Mishna Peah 1:4. Saul Lieberman in Tosefta Kepshuta suggests that Rebbi Elazar Ben Rebbi Tzadok mentions the jujube (specifically Ziziphus Vulgaris) with regard to Peah, because it may have been imported in to the Land of Israel by the Romans during his lifetime and was a new type fruit whose cultivation was not yet very familiar to the Jews in Roman Palestine. There were two Tannaim by the name Rebbi Elazar Ben Rebbi Tzadok. The first one lived in the second half of the 1st, beginning of the 2nd centuries CE and was a witness to the destruction of the Second Bet Hamikdash. The second one lived in second half of the 2nd century CE and was associated with Rebbi Yehudah Hanassi, the author of the Mishna. It is not clear which one of these two Tannaim is the author of this statement regarding jujubes. If Lieberman is correct, then it makes more sense that Rebbi Elazar Ben Rebbi Tzadok I, is the author of this statement, because the cultivated jujubes (Ziziphus Vulgaris) were introduced into Italy from Africa by the consul Sextus Papinius Allienus in the year 36 CE, during the reign of emperor Augustus, as mentioned by Pliny the Elder (Natural History, 15:47). It was probably introduced into Palestine around that time as well. Mishna Sheviit 5:1 states that Benot Suach fruit ripens once every three years. Yehudah Felix (Mishnat Sheviit p.124 on Mishna Sheviit 5:1) says that Benot Suach cannot mean literally “white figs” as stated by Talmud Bavli (Berachot 40b), because there is no such type of fig in the world whose fruit ripens once every three years as mentioned by the Mishna. 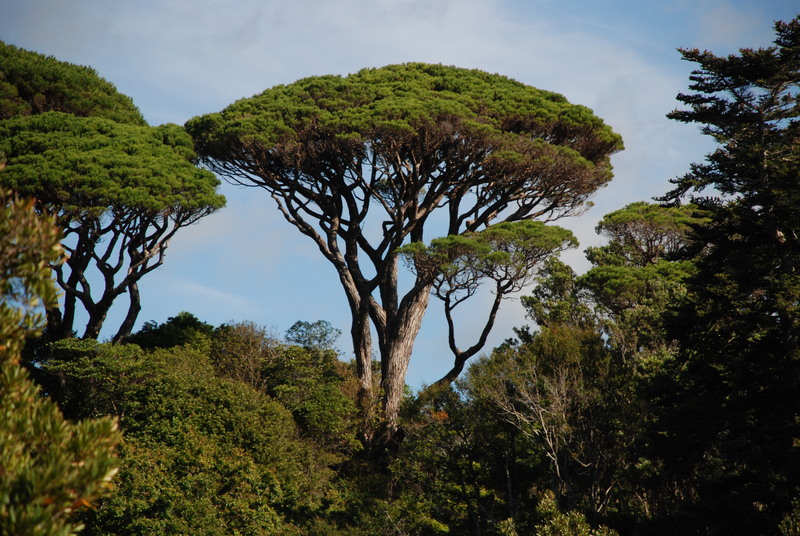 Felix himself says that Benot Suach is some type of a pine tree. That makes sense since pine cones take 2 – 3 years, depending on the species, to mature on the tree and the Mishna mentions that Persian Benot Suach took 2 years to ripen as opposed to Palestinian ones that took 3 years. Saul Lieberman in Tosefta Kepshuta on this Tosefta identifies Benot Suach as pines as well. Lieberman goes further to say that Talmud Yerushalmi (Sheviit 5:1, Daf 13a) identifies Benot Suach with a plant called Pitirea, which he says should be really spelled Pitidea and comes from the Greek word πιτύδια (Pitudea) (meaning of which to me is not clear), which in turn comes from the Greek word πίτυν (Pitun) which means a pine tree. He says further that “white figs” was a folk name for pine cones used among Greeks and adopted by Jews as well. Even though pine cones take 3 years to mature the tree produces eatable cones every year after its first 3 years of cone production, so the cones that grew in a given year all ripen together 3 years later, which is considered by Acherim (others) to be a single harvesting season, which makes them obligated in Peah. 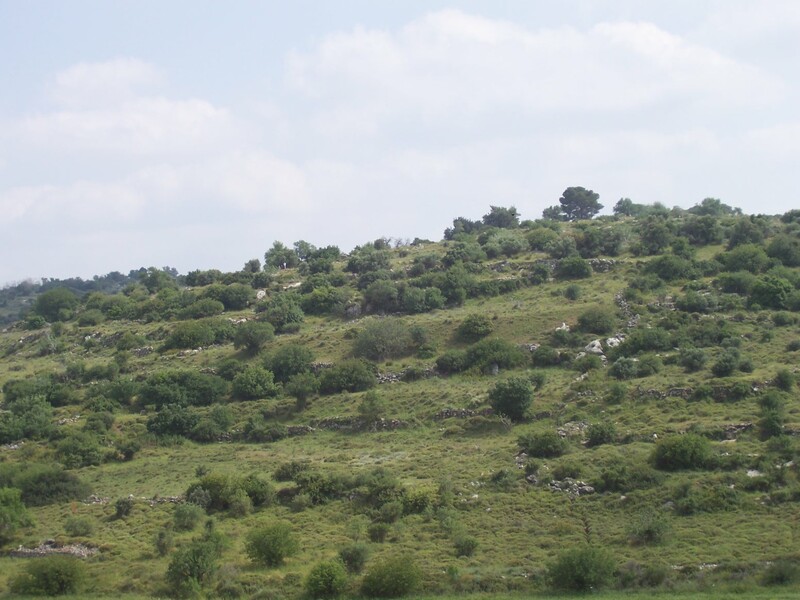 The specific species of pine tree referred to in the Tosefta is most probably Pinus Pinea, also known as Stone Pine, which grows in northern Israel in the Galil, has edible nuts, and which is one of few pine species whose cones mature in almost 3 years. Other pine species that grow in Israel such as the more common Pinus Halepensis, known in Hebrew as Oren Yerushalayim – the Jerusalem Pine, have their cones mature in 18 months. Aruch Hashalem (Vol. 2, entry Benot Suach) identifies this plant as Small Goat’s Thorn (Astragalus Poterium), which is a large shrub with sharp tasting seeds that have a sweet scent. His identification is based on the same quote in Talmud Yerushalmi (Sheviit 5:1, Daf 13a) which explains that Benot Suach is a plant called Pitirea, which he identifies with the Greek word ποτήριον (Potirion) which is the Greek name for Small Goat’s Thorn. The problem is that Small Goat’s Thorn does not really produce a useful fruit that is harvested for food consumption so it does not make any sense that it would be obligated in Peah, and also its seeds ripen yearly and not once in three years, so this explanation is incorrect. 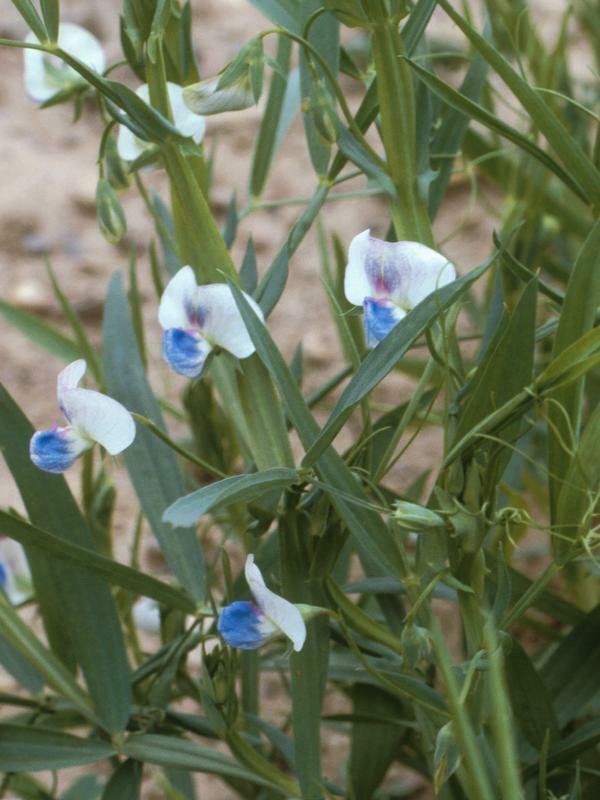 Saul Lieberman in Tosefta Kepshuta identifies this plant as Lathyrus Sativus, known as blue sweet peas or grass peas, which is a type of edible peas. He says that the correct spelling of the word probably should be חלחלין (Chalchalin). I have a suggestion for the origin of its Hebrew name – חלחלין (plural of חלחל). The word חלחל (Chalchal) means “poison”. See Marcus Jastrow, Dictionary of Targumic Literature, entry חלחול. The seeds of blue sweet peas, contain variable amounts of a neurotoxic amino acid β-N-Oxalyl-L-α,β-diaminopropionic acid or ODAP. ODAP is considered as the cause of the disease neurolathyrism, a neurodegenerative disease that causes paralysis of the lower body: emaciation of Gluteal muscle (buttocks). The disease has been seen to occur after famines in Europe (France, Spain, Germany), North Africa, South Asia, and is still prevalent in Eritrea, Ethiopia and Afghanistan (pan handle) when Lathyrus seed is the exclusive or main source of nutrients for extended periods. Research has shown that ODAP concentration increases in plants grown under stressful conditions, compounding the problem. See S. L. N. Rao, P. R. Adiga, P. S. Sarma, “The Isolation and Characterization of β-N-Oxalyl-L-α,β-Diaminopropionic Acid: A Neurotoxin from the Seeds of Lathyrus sativus”, Biochemistry, 1964, 3 (3), p. 432–436. It would seem that people at the time of the Tosefta knew about this property of blue sweet peas and therefore called it “poisonous”. Due to this reason the Tosefta had to specify it as a species obligated in Peah, since one might think that since they could be poisonous they should be exempt from a commandment meant for providing food to the poor. Despite this property it seems that it was still consumed as food, as it is many areas today, and therefore was still obligated in Peah, since it as a type of legumes, all of which are obligated in Peah as mentioned by Mishna Peah 1:4. Lathyrus Sativus – blue sweet peas. Note the blue flowers. The peas themselves hang in peapods from the sides of the stem.